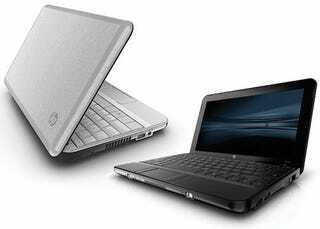 HP revealed a couple of new 10.1" screened netbooks for its Mini line. They'll be offered in both Windows and Linux versions, and one model, the 110, even has an optional graphics accelerator which HP claims can produce seamless 1080p playback. If these new netbooks were sections of a mullet, the Mini 1101 would be the business up front. It's only available in Windows (XP or Vista), and only in boring professional black. The Mini 110, on the other hand, is the party in back: It offers Windows XP or Linux and has an optional Broadcom Video Accelerator for some maybe-HD-maybe-not video playback. But otherwise, they're pretty standard HP Minis: Both use the 1.6GHz Intel Atom processor, 1 or 2GB of memory, and either a 160/250GB hard drive (250GB only with Linux) or a 32GB SSD. Both include autosyncing software, so you can sync all your documents, media, and files easily with your main computer.